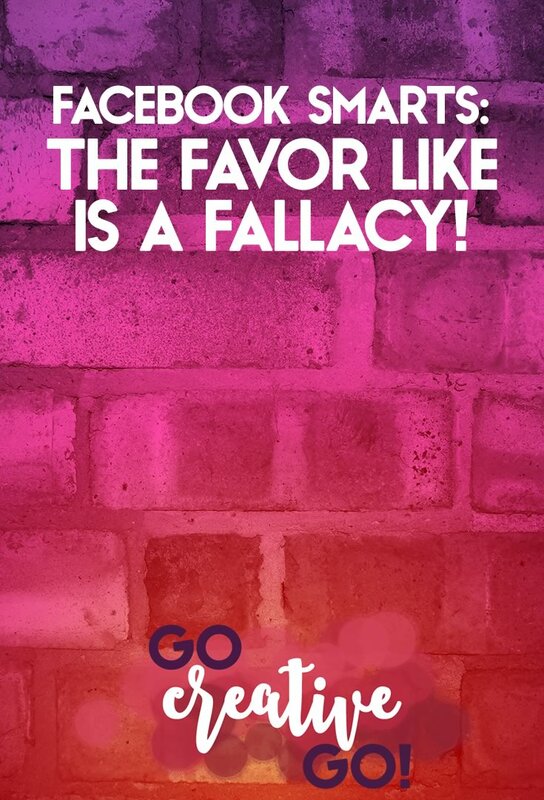 Facebook Smarts: The Favor Like Is A Fallacy! - Go Creative Go! Facebook Friday! Funnily enough I still see these happening on many a page. Even in the wee hours this morning, I saw several that must have been posted at midnight sharp, in order to maximize all the hours in this day. Facebook Friday Events Are Still All The Rage? I’m not sure I’d say they’re still all that and a bag of chips, but they certainly haven’t disappeared. And they don’t always happen on Fridays! But you know I live to alliterate, so deal with it! Facebook like events really haven’t evolved all that much, which is to be expected. Let’s face it, they’re not all that complicated. It ain’t rocket science, after all. One thing remains the same, sadly enough. Many who take part in these “like” building sessions don’t really fathom the ethos of the Facebook like. They still think “the more the better,” regardless the intent, purpose and quality of the given like. One thing tends to repeat and stand out, and continues, even after years in the social media biz, to be a bit of a head scratcher – it makes me wonder where people’s social business priorities really lie. That Favor Like? It’s Not Doing You Any Favors! I don’t like any page as a favor. This “you scratch my back, I’ll scratch yours” misconception is very disconcerting. It ‘s counterintuitive to the social process. Yet, it prevails. Why would you want someone to like your page when their’s little chance they’ll ever actually interact with you beyond that mouse click? When pretty much the only way to ensure Facebook engagement is to pony up dollars and cents, with boosted posts and advertising, I simply can’t understand why you’d want to minimize any chance you have of creating real interaction and community by calling for a bunch of likes that are essentially worthless. What’s A Facebook Like Worth To You? Though Facebook is not the place I spend the bulk of my social media time, taking a more formulaic approach for more than a year now, I do still like pages and try to interact with interesting page posts when they do show up in my feed. I like your page if the content is interesting, current and valuable. You should like pages for the same reason(s). Is the “topic” of the page’s information something that interests you or your customer base? Are the links timely, on target and informative – thus worthy of sharing? Do you like the page/page owner’s style? Do you learn something new and valuable that can be applied to your own social business pursuits? Is the product or service something you might purchase now or in the future? We’ve all fed the fire with a favor like. We have all liked a page for a friend or family member just starting out. It’s human nature to try to help out those that we know, like and trust. However, when I see your page for the first time at a “like” party, I don’t know that I know, like or trust you? I have to take the time to check out your content, see if your posts are consistent and valuable and see what sort of responses you get from your current fans before I think about clicking that like button. That takes a little time and effort. It can’t be done in seconds. So I’m certainly only going to do it with pages that immediately stand out as valuable to who I am and what I do for a living. Casual connections, favor likes, don’t truly benefit anyone. They don’t build real relationships or start real discussions. C’mon, admit it. These are the kinds of pages that you eventually hide from your feed or even unlike when you realize you’re just not interested in what they have to say or share. What’s the point? I connect with people and pages with whom/which I want to interact and share. Makes sense, if you think about it. Right?